NOTICE: Because the compressor operates at high voltages, wear electric insulated gloves and pull out the service plug to cut the high-voltage circuit before inspection. (a) Wash the area with lots of cold water. CAUTION: Do not rub your eyes or skin. (b) Apply clean petroleum jelly to the skin. (c) Go immediately to a hospital or see a physician for professional treatment. If there is not enough refrigerant in the A/C system, oil lubrication will be insufficient and the compressor may be damaged. Necessary care should be taken to avoid this. Open and close only the low pressure valve. 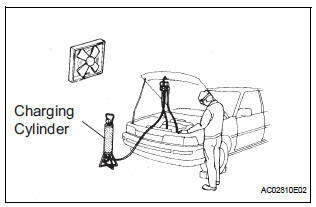 If the high pressure values are opened, refrigerant flows in the reverse direction causing the charging cylinder to rupture. If the high pressure valve is opened, refrigerant flows in the reverse direction causing the charging cylinder to rupture. If refrigerant is overcharged, it causes problems such as insufficient cooling, poor fuel economy, engine overheating, etc. (a) This vehicle is equipped with an SRS (Supplemental Restraint System) such as the driver, front passenger, side, curtain shield air bags etc..
Failure to carry out service operation in the correct sequence could cause the SRS to unexpectedly deploy during servicing, possibly leading to a serious accident. Before servicing (including removal or installation of parts, inspection or replacement), be sure to read the precautionary notices on (See page RS-1). 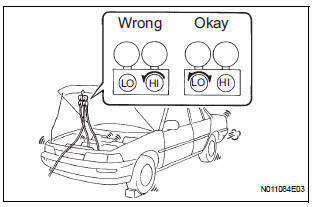 (a) While using the battery during inspection, do not bring the positive and negative tester probes too close to each other as a short circuit may occur.